Außergewöhnliche Sea-Front Design Condo, privater Garten gegenüber vom Strand! In wenigen Minuten zu Fuß zu Geschäften, Restaurants, Museen, die Altstadt und das historische Hotel Negresco. * Helle, helle, moderne und moderne Gartenwohnung mit Teakholzterrasse und großer Markise. 5 Minuten von Einkaufsmöglichkeiten und Restaurants entfernt. 10 Minuten vom Flughafen / Hubschrauberlandeplatz und Zug. Eine halbe Minute vom Strand und Aktivitäten! Badewanne, Dusche Italienisch, Französisch-Becken. Holz Teak Boden, und Designer-Accessoires. Lovely, convenient and well-equipped apartment! We loved our stay in Richard's home. It was so convenient, well-equipped and so pretty! Richard and his team made us feel warmly welcome and helped us settle in. We hope to come back to this same apartment AND discover Richard's other properties. We are very glad to welcome you. You should try Marseille's property! Listed 16776 on VRBO. 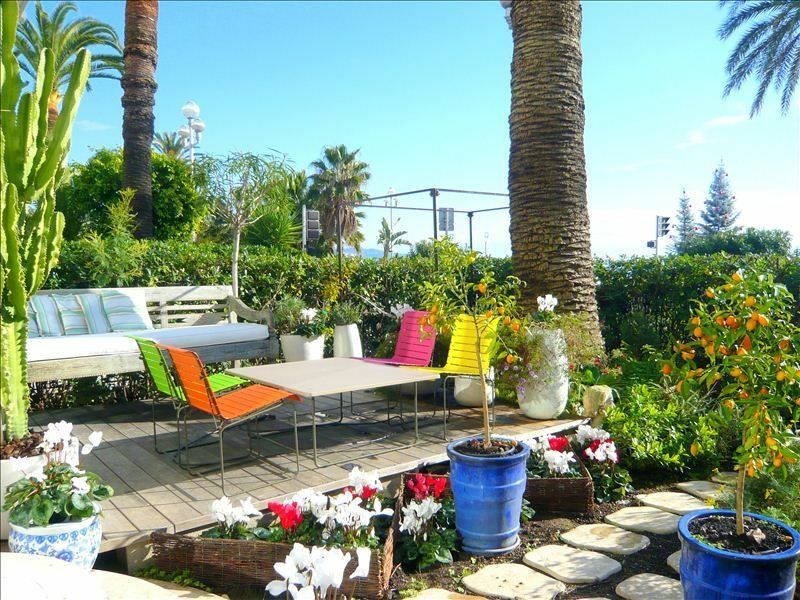 The apartment was directly across from the beach, and the combination of the sea view and the garden, (where we dined al fresco – such a treat! ), was amazing. Also, our 8 year old especially loved the outdoor jacuzzi! The bus to the center of Nice is conveniently located across the street, and we often took day trips to other Riveria towns with our rental car, which we were able to park in a nearby garage. A supermarket and patisserie are located on the street behind the apartment, which made shopping for food very easy. We would definitely stay at this apartment again when we return to Nice. Thank you Richard! It was a pleasure to welcome you, and we are glad you enjoy so much your stay here. See you another time with pleasure. Lovely space very centrally located and close to everything!! Space felt safe despite being on the first floor. Would recommend letting down shades when not in the unit for safety reasons. Host was was kind yet odd so a heads up for those women who may be traveling alone. Overall lovely experience and would stay here again. The appartment is very comfortable. You will find everything you need for living. The location is good, near the center (15 min walking). Supermarket is close to apartment. The host Sam was very kind and welcome. I highly recommend this apartment. You'll like it for sure! Great location. Modern studio with many comforts. We enjoyed being across the street from the beach and in the heart of great restaurants and cafes. Easy to get to from the airport as well. The flat itself is comfortable and completely electronically wired. Wonderful terrace as well. Thank you Justine for your stay! See you next year at Nice or Marseille! Contract is send between owner and guests. An explanation booklet will be send prior arriving to the apartment in order to get familiar with the apartment.